Healthy cookies for breakfast? Yes, this is possible! These easy breakfast cookies are loaded up with tons of chocolate and only contain 150 calories each! Whoa, four days into January and we’re already back to cookies again. We might be looking at a record here, friends! Seriously though, it was only a matter of time. Cookies and me just can’t stay away from each other, and thus, healthy breakfast cookies fix all the problems. The problem which is the fact that cookies are pretty much outlawed after New Years and dude, I am so not cool with that mindset. So I had to get a little creative and take things up a notch on the health-o-meter. The result equals complete breakfast to midnight-snack fare. In conjunction with the fact that each cookie contains only 150 calories. So there’s that. I’ll just leave that statement up there and wait for you to finish your healthy breakfast cookie victory dance. So what kind of cookie wizardry do we have going on here? Don’t be nervous, because there’s no weird, gross-ish ingredients replacing all the usual fat in these cookies. I’d bet all my leftover cookies you have everything hanging out in your pantry right now! Mashed ripe banana, an egg, and yogurt step up to the plate and replace the butter. Quick-cooking oats replace a lot of the flour and contribute the super-chewy texture. Unsweetened cocoa powder and chocolate chips take care of all your indulgent needs. Be aware that the dough for these cookies will be very soft and slightly sticky. That’s the kinda consistency we’re looking for! Chilling the dough isn’t even necessary, because these cookies don’t spread too much while they bake. In fact, you’ll want to flatten them slightly after rolling into balls. Also, all the cookies should probably be eaten right at that moment. Living la cookie loca we are. Oh, and before I forget. My extreeeeeemly cookie-snobbish siblings were never the wiser that they were actually eating ultra-healthy cookies for breakfast. I think they just really thought that I lost my mind and was letting them eat chocolate cookies for breakfast, so there were no questions asked. Only much cookie face shoving. In a large bowl, whisk mashed banana, sugar, egg, yogurt, and vanilla until smooth. In a separate bowl, combine oats, flour, cocoa, baking soda, and salt. Beat flour mixture into liquid until a dough forms. Gently stir in chocolate chips. Roll dough into 1-in balls and place on prepared baking sheets. Gently flatten. Bake cookies in batches at 350F 9-10 minutes (middles will still look soft---this is ok) Cool cookies on baking sheet 5 minutes, then transfer to a wire cooling rack. Enjoy warm! These look like the ultimate breakfast cookies, Sarah! I love that they’re healthy and contain double the chocolate! Just what I ned to get my diet back on track! Sorry but 3/4 cup sugar is not healthy. What are they like w/o sugar? Except the sugar in the choc bits. The sugar is necessary in these cookies because without it they would be quite bitter. You’re telling me that I can eat chocolate chip cookies for breakfast!? I love you so much more now. Gotta try these Sarah! Totally the best excuse ever right?? Thanks Melanie! I could totally get down with eating cookies for breakfast! Love that these are chocolate and healthy. Yum! Thanks Jen! Nothing not to love about cookies for breakfast, right? Mmm…these cookies look delectable! So chocolatey! Kelly // The Pretty Bee: Allergy Friendly Eats recently posted…Immunity Boosting Triple Berry Kiwi Smoothie. Double Chocolate and Breakfast?! Sign me up!! Thanks Christin! Happy New Year to you too! I am always up for cookies for breakfast! Love these Sarah, pinning! Cookies for breakfast? You are my hero!! Especially because they are healthy. YUM!! Absolutely a cookie WIN! 😉 Thanks Renee! You are totally cracking me up with the cookie loca! These breakfast cookies wouldn’t last five minutes in my house. Three cheers for breakfast cookies!! These look beyond phenomenal…all that gooey chocolate FOR BREAKFAST?! Sign me up! Aww thanks girl! You totally need to try these! You’re so right — cookies can totally be made healthy! I mean muffins can, so why not cookies?? I love the double whammy of chocolate here, and the banana flavor sounds just perfect! Can’t wait to try these! Happy New Year Sarah! I’m so excited to try these cookies! They look perfect! Thanks for this amazing and healthy recipe! Let me know if you try these cookies, Mira! Happy New Year, girlie! OMG, these look great! I’m doing Atkins, so I’ll tweak them for that. Eleven comments … but none after having actually made these cookies? I hope they are as good as they sound. Does anyone have some post-baking reviews and tips about these cookies? I agree…lots of comments, but no one had made them yet. So, here’s my take….they’re good. Here are the changes I made: reduced sugar to 1/2 cup (used brown sugar), didn’t have white whole wheat flour, so I used 1 cup of whole wheat flour and 1/2 cup of white flour. I also used old fashioned oats instead of the quick oats. Everything else was the same. I think they are yummy and hope my kids agree. Will probably microwave a few seconds before serving them as after school snack. You’re welcome. By the way, my kids loved them too! I nuke them for about 10 seconds before serving. The dough is very dry and dense. If I make these again, I might add more liquid (a second banana, another egg or/or more yogurt) or use a little less flour and/or oats. Except for the chocolate, the flavor was pretty bland and the texture quite dry. They were definitely not too sweet (and I don’t like overly sweet cookies). I think they need something to perk up the flavor and to make them more like a cookie, but I’m not yet sure what. Thank you for the great feedback on these cookies, Mike! It is important to underbake these cookies rather than overbake, as they do tend to dry out if you leave them in the oven for even a few additional minutes. I was just wondering how they should be stored – in the fridge or not? Thx for this lovely recipe! Glad to hear you loved these! They can be stored at room temp up to two days. Okay, thank you for your quick reply! Do you think these cookies can be made with stevia instead of brown/coconut sugar? 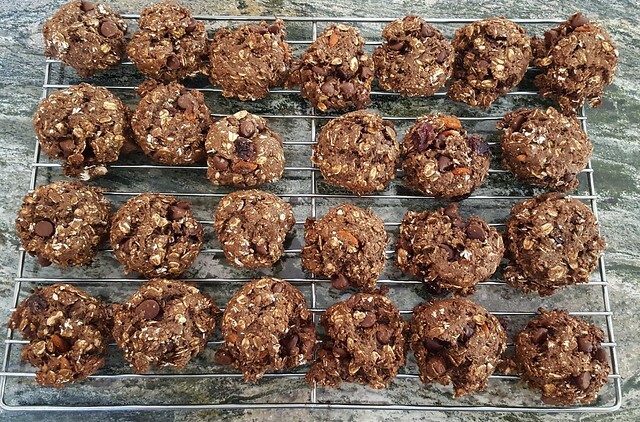 I loved this healthy cochoclate cookies, one little modification I did is to add 1/4 of coconut oil per portion because the dough seemed a bit dry…at they came out delicious and soft. I just made them. They are too thick. Either too much flour or not enough liquid. I even added 1-2 tbsp more of yogurt. It didn’t help. I was excited to make them but I can’t say I am satisfied. The taste is good, not too sweet and just enough salt. It’s the consistency that is problematic. I just made these cookies and I love them 😍 I cut the sugar to 1/4 cup (I cut sugar in almost all baking recipes, personal choice only) and I used whole wheat only. I also replaced the plain yoghurt by low-fat curd cheese (I’m not sure it’s the correct translation, in Switzerland we call that “séré maigre”) because it’s all I had on hand. They came out definitely on the dryer side but not too dry at all for my taste, and they were light and fluffy enough. They tasted just right, not bitter at all! Thank you so much for this recipe, I never thought I would manage to eat chocolate cookies for breakfast!!! I made these today and OMG!!! They were not dry at all!! They were chewy, gooey, and chocolately. I cut the sugar down to 1/2 cup (used dark brown sugar) and used a little less then 2 cups of oats (because I ran out.) I also used unbleached white flour and they turned out amazing!! Thank you so much for the recipe. My 20 month old loved them too! I will definitely be making them again.